Suborder Troctomorpha comprises 49 families of bark lice, book lice, and parasitic lice in the infraorders Amphientometae and Nanopsocetae. 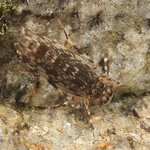 Molecular analysis supports to the placement of the parasitic lice (Phthiraptera) in suborder Troctomorpha, along with the bark lice and book lice families traditionally included in Troctomorpha. Phthiraptera is placed in infraorder Nanopsocetae (18S nDNA, Johnson et al. 2004). Molecular studies of bark lice (excluding Phthiraptera) support the monophyly of Troctomorpha and the infraorders Nanopsocetae and Amphientometae (18S rDNA, and 12S, 16S, COI rDNA, Johnson and Mockford 2003; 18S rDNA, histone3 nDNA, and 16S mtDNA Yoshizawa et al. 2006). Johnson, K. P. & E. L. Mockford. 2003. Molecular Systematics of Psocomorpha (Psocoptera). Systematic Entomology 28: 409-40. Johnson, K. P., K. Yoshizawa, and V. S. Smith. 2004. Multiple origins of parasitism in lice. Proceedings of the Royal Society of London B 271:1771-1776. Lienhard, C. and C.N. Smithers. 2002. Psocoptera (Insecta) World Catalogue and Bibliography. Muséum d'Histoire Naturelle, Geneva, Switzerland. Mockford, E. L. 1993. North American Psocoptera (Insecta). Gainesville, Florida: Sandhill Crane Press. Smithers, C.N. 1972. The classification and phylogeny of the Psocoptera. Memoirs of the Australian Museum 14: 1–349. Yoshizawa, K. and K.P. Johnson. 2006. 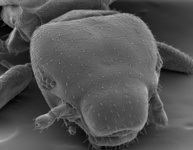 Morphology of male genitalia in lice and their relatives and phylogentic implications. Systematic Entomology 31: 350-361.